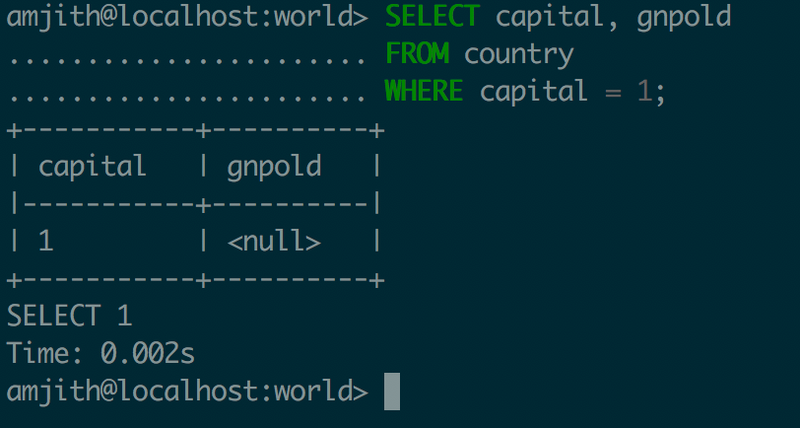 When I first set out to create pgcli, my goal was to design a Postgresql client that shipped with sensible defaults. It shouldn't require fiddling with config files to enable features. How did we do on that goal? This is one of those subjective goals that is not so easy to measure. But fortunately, Craig posted a useful blogpost that shows how to configure your psql shell to make it powerful. I figured I'll use that as a scoring card to see how many of those features are shipped by default in pgcli. One of the things covered in the blogpost is customizing the prompt to show the server name and the database name. Both of these can be overridden via the config file (~/.config/pgcli/config) but you hardly ever have to change the defaults. By default psql won't show the NULL values in a table. You could force psql to show a placeholder value via pset null. In pgcli the null values are always shown and they are show as <null>. Once again this can be overridden to any character of your preference via the config file. You can time your sql queries by enabling \timing in psql. This is enabled by default in pgcli. Every query is timed and the results are displayed at the bottom of the output. History in pgcli is unlimited. But pgcli has no option to separate the history for different databases. The feature described in the blogpost talks about a cool feature to store the history of a session scoped to a database. This is an awesome feature that we might adopt in pgcli in the future versions. Expanded mode in psql is a way to output the results of a query if the output is too wide to fit in the screen when shown as a table. This can be toggled by \x on or \x off. The \x auto command in psql will intelligently choose between the table format or the expanded format based on the screen width. In pgcli, we have the ability to do this but this is not enabled by default. It has to be enabled via the config file (~/.config/pgcli/config) by the user. I don't think we'll change this behavior. One of the psql options is to choose either the upper case or lower case for keyword completion. So when you type sel and then hit tab, psql will auto-complete SELECT if upper-case was chosen as the option. In pgcli we have those explicit 'upper' and 'lower' options. In addition we have an 'auto' option which is set as default. This will choose the casing based on what the user has typed so far. So if you type sel and hit tab, pgcli will suggest select, whereas if you type SEL and hit tab it will suggest SELECT. I'm sure there is a way achieve this in psql, but this is the option that pgcli ships with. We have plenty of other config options that ship with default values. You can see a list of all the config values in ~/.config/pgcli/config if you have pgcli installed or you can checkout the pgclirc file for a quick view. Let us know how we did.